Got out with Andy today. We fished an inshore lump and a few wrecks. 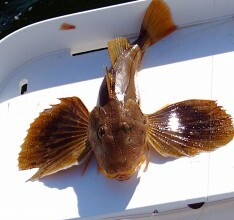 We didn’t have anything specific in mind, hoping for a few Flounder and maybe some Triggers. To say we got a mixed bag is almost an understatement. We got quite a variety today. Fished the last few hours of the incoming tide through the turn and a few hours of the outgoing. Used Herring, Mackerel, Squid, Mullet, Green and Shedder Crabs for bait. We started on the lump and made 3 long drifts. Great, slow drifts right across the lump, but all we managed were Skates, Sea Robbins, and a small Blue Andy nailed. We decided to head farther out and try a few wrecks. First we hit a buoy, and made a few casts around it, resulting in some small Sea Bass. The first wreck was pretty quiet, not much hanging on it. 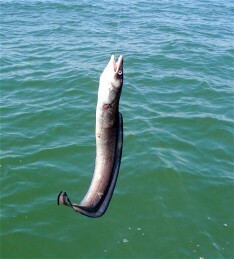 I did manage to pull a Kingfish off it though. Our next stop resulted in a few more Sea Robbins and some overly curious Brown Sharks. One grabbed my Fluke Ball and took off with it. We moved to another wreck near by. When we stopped, 4 Brown Sharks came right up to the boat. Reminded me of my dog begging at the table for scraps. So, I tossed them a scrap of Bluefish attached to a shark rig I dug out of my rig bag. It didn’t take long for a nice one to find it, and the fight was on! I brought out my shiny new toy, a GoPro camera, and had hoped to catch the acrobatic fight on video. Instead I hit the wrong button and got some weird still shots. 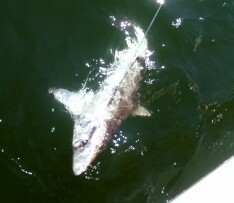 Definitely a learning curve here… Anyway, had a great battle with the Brownie and released him at boat-side. Moved on to the next wreck. To much boat traffic. So we headed farther in to our next wreck. Found it and tossed the wreck anchor onto it. Actually got it to snag on our first try! That never happens. The wreck was loaded with small to just over keeper sized Tog. As soon as you hit the bottom, you had one on or your bait was gone. Shedder Crab was the hot bait, with Green Crab dashed with Shedder oil working just as well. Never touched the Clam. We caught Tog after Tog, hoping to get the Triggers interested. FInally got a Trigger, but lost it at the boat. Also caught a bunch of Bergalls. Tried live-lining one in hopes of a big Fluke or something else, but nothing took it. 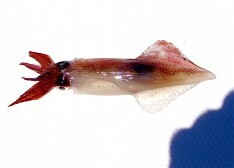 Also got a Squid on a piece of Clam. And a huge Eel on Herring. Caught a Mother-In-Law too (Oyster Cracker). Finally, when we were about to quit, I nailed another Trigger. Tried for a bit longer, but it was all Tog. Wish it was still Tog season! Would’ve been eating well tonight. Went to pull the wreck anchor so we could head home, but it was stuck fast. We tried every which way to pull it free, but it wasn’t happening. So, we cut it loose. The funny thing is, we found it at the same wreck our last trip out there. Easy come, easy go. Had a blast today. Ocean doesn’t get much flatter. Hope the fishing continues to improve.